Feel the magic of the night with the Enchanted Evening Tulip Mix. 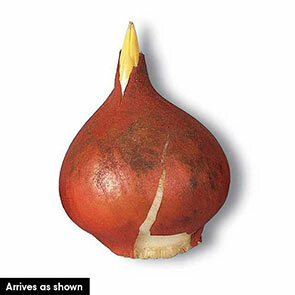 This sweet-and-sultry collection blends various perennial tulip bulbs, which periodically bloom in mid to late spring. Bulbous, deep purple Triumph tulips round out next to slender, white and purple Lily-Flowering tulips, feathery lilac blue Parrot tulips, and an awe inspiring array of other white, pink, and purple strains. The flowers' blooms range in shape, texture, and size, and each grows between 16 and 20 inches tall. Infuse your garden with this bewitching mix by planting your perennial tulip bulbs in the fall. Tulips are sensitive to water saturated soil, so make sure to plant them in well-drained clay, loamy or sandy soil. Bury your tulips about 2 inches deep and 3 to 4 inches apart in either full sun or partial shade. They are hardy in zones 3 through 8 and require little to no maintenance during their blooming season. With its dusky, twilit tones, the Enchanted Evening tulip mix adds hushed beauty to border gardens. Consider pairing it with other delicate spring flowers, such as pink and white daffodils and pastel blue irises. This Dutch-sourced mix is also great for large scale plantings and cutting gardens if you wish to wash your home and garden with its entrancing hues. Swathe your garden in sunsets with the Enchanted Evening tulip mix. Blue tulips in an intriguing variety of shades, shapes and forms! 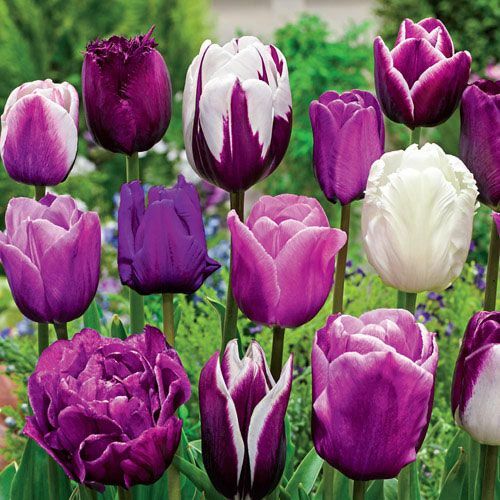 Featuring triumph tulips in shades of purple, parrot tulips in lilacblue, lily-flowering tulips in white and blue, and many more, this tulip mixture is the perfect way to create a season of colour with a single mass planting. Excellent for use as border plantings and cutting gardens, too!